Okay, the fact that I just wrote June 24 kind of freaks me out, because it doesn't feel like it ought to be late June. It feels like early June. Because I went away in late May, so it should now be early June. The 16 days of time warp kinda messed with my internal calendar. That also freaks me out because when I stop to consider the major out-of-town family things that happen before my next show, I have TWO MONTHS to get ready for Jackson Hole. And that means I need to be cranking stuff out in addition to commissioned work. Egads. 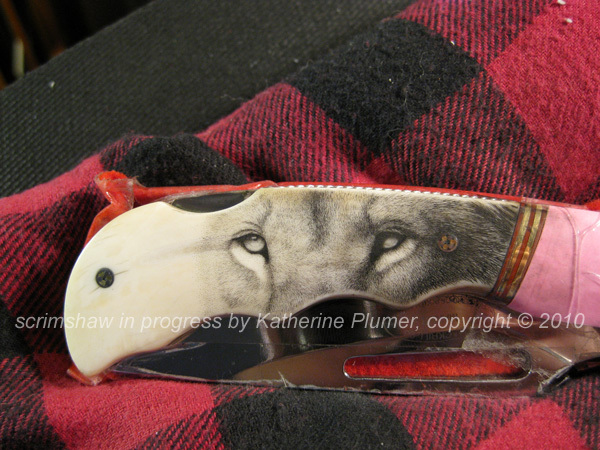 Right now I am working on two knives. These came in right before Blade Show. 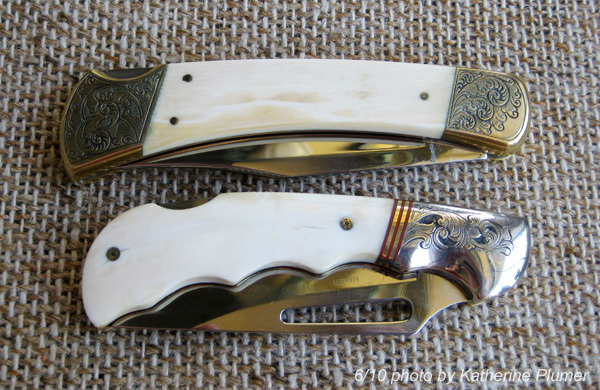 They are admittedly not "high end" knives, but they more than make up for that in sentimental value for their owner, and often times that seems to be what matters most anyway. 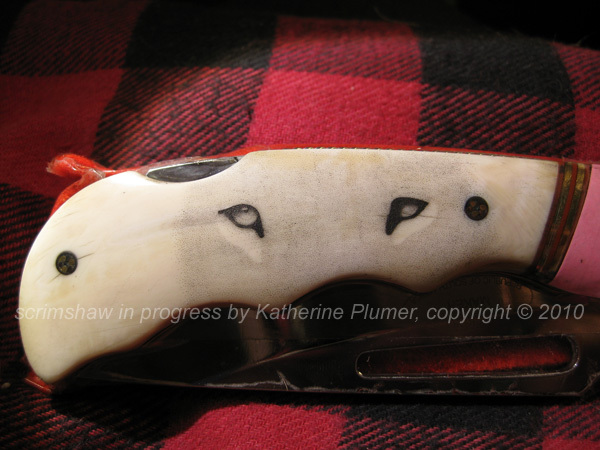 Both knives are already scrimmed with the owners initials on the opposite side. Since that was done by someone else, I won't show it to you. These blank sides were done by someone else too, but not to the client's satisfaction, and they were sanded off and now are in my hands. They are both to be scrimmed with African Lions, and minimal backgrounds. I really took some time to figure out the best composition for each knife. One will be in color, one in b/w. One will have a whole lion, the other will only have part of a face. 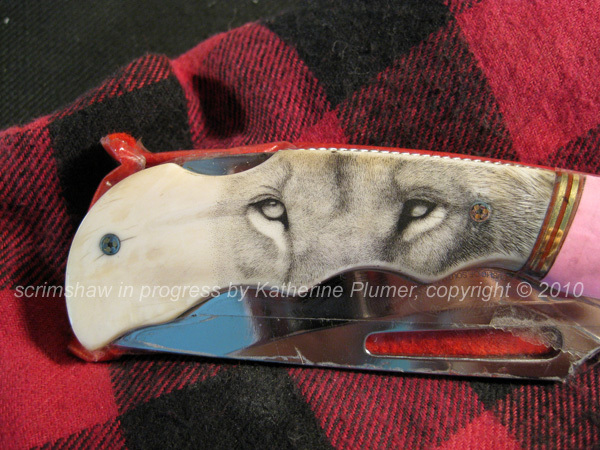 Having done a bunch of color stuff just before Blade, I decided to do the b/w knife first for a change of pace. Slowly the beast emerges. 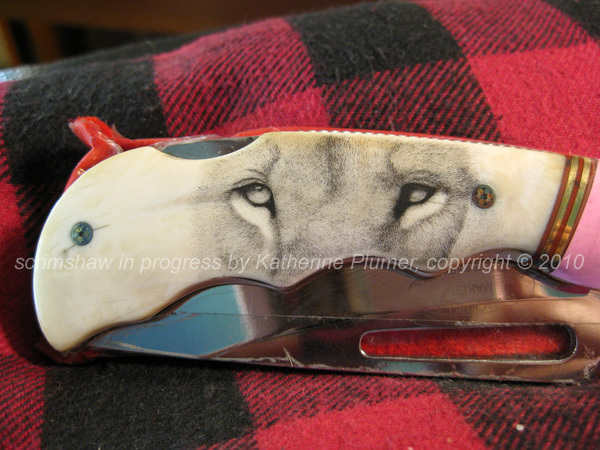 Geesh I love doing scrimshaw! Oh, and this is more than one day's progress! I hate it that we've already passed the summer solstice and now we're going downhill for the rest of the year.